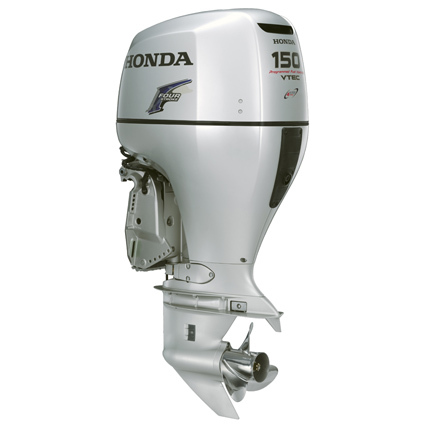 Honda 135hp Outboard, Honda BF135 LU, Long Shaft (20″) Electric Start, Power Trim and Tilt, 12volt/40 amp and Control Box. This is a 2.4 litre, high torque Honda 135hp outboard engine that is a long shaft, electric start, power trim and tilt, 12volt/40amp alternator, control box model. 6 years warranty (2 years for commercial users) and includes many unique features and user benefits including free RYA level 2 powerboat training. PGM-FI (Programmed Fuel Injection) equals great fuel economy. BLAST (Boosted Low Speed Torque) amplifies torque by optimising the amount of fuel supplied combined with ignition timing during rapid acceleration. NMEA 2000. (national marine electronics association) Allows communication between marine engines and devices such as depth finders, nautical chart plotters, navigation instruments, tank level sensors etc. Comes with: Basic flexible rigging package. Side mount control box, harnesses,Fuel line , Battery leads, Tachometer and trim gauge, a choice of 3 blade alloy propeller ,Tool kit, Owners manuals. Rigging kits can be upgraded to include different controls, more gauges, longer harnesses, stainless steel propellers and rigging hose covers. The price includes FREE shipping, and VAT. Followed by a call from one of our certified Honda outboard engineers within 48 hours of delivery. Outstanding propulsion efficiency is matched with a 2.14 reduction gear ratio to deliver high-thrust power. Great fuel economy with an electronic fuel injection system that achieves lean-burn control while cruising. Precise optimization of air/fuel ratios, referred to as ECOmo by Honda. Four warning lights, including an oil pressure alert, overheat alert, ACG warning, and PGM-FI electronic fuel injection system warning to detect any malfunction or irregularity and alert the operator. A flush valve joint permits easy engine cleaning after use. Outstanding environmental performance, surpassing US CARB emissions standards the most stringent in the world. It also exceeds secondary restrictions on marine engine emissions established by the Japan Boating Industry Association by a significant margin. Honda 150hp Outboard, Honda BF150 LCU, Long Shaft (20″), Counter Rotation, Electric Start, Power Trim and Tilt, 12volt/40 amp and Control Box. Honda 115hp Outboard, Honda BF115 LU, Long Shaft, Electric Start, Power Trim and Tilt, 12volt/40 amp and Control Box. Honda 150hp Outboard, Honda BF150 XU, Twin Engine Package, Extra Long Shafts (25″), Electric Starts, Power Trim and Tilts, 12volt/40 amps, Dual-Mount Control Boxes and Adjustable Engine Bars. Honda 135hp Outboard, Honda BF135 XU, Extra Long Shaft (25″), Electric Start, Power Trim and Tilt, 12volt/40 amp and Control Box.